Alright, so maybe The How to Train Your Dragon movies aren’t the most original stories. Thankfully, as movies, the visuals are perhaps the most important part of the film, especially in these animated creations. And here, How to Train Your Dragon, like its predecessors, succeeds. The scenery, the dragons, the vikings, everything looks gorgeous and so lovingly crafted. However the plot, the writing that should really be supporting all of this eye candy frequently falters. There are emotional beats that lack the punch they want, very little feels earned, and whenever the plot needs a kick to get going, it is delivered via flashbacks injected seemingly haphazardly to the film. A flashback begins, whatever it specifically is about will be acted upon in the scene immediately following. It feels basic at best, amateurish at worst. The film isn’t a disaster. It has some genuinely cool ideas, the villain being a sort of Evil Mirror to our inventor hero Hiccup could have been something really interesting if explored in any way (its not). The concept of letting go and passage of time and friendships are all there ripe for exploring, but instead the movie just plods through them, hoping to tug on the heartstrings without having to lift a finger. The titular ‘hidden world’ is barely explored, seen just once, and seems far from the central idea of the movie, but it is an evocative phrase, unfortunately it fails to deliver on the importance of this place. As I said, this isn’t the worst movie out, it’s not even really bad, just lacking. Instead of having real value it feels like a quick cash in to end a franchise before the real estate it’s rented out in the hearts and minds of fans is forgotten. I wanted to feel it more than the movie wanted to work for it. 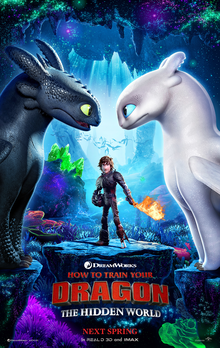 How to Train Your Dragon: The Hidden World is in theaters now.